WWF (or WWE as it is now) was a 1990s phenomenon, so an arcade crossover was inevitable - and what a crossover it was! 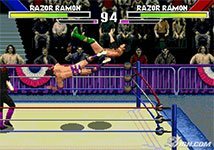 One of the most button-bashing games of the 90s - WWF Wrestlemania was an arcade classic that you could hear being played from the other side of the arcade! While the original cabinets are now sadly rare, man of our multi-game retro arcade machines have this game in their games list - meaning you can experience the classic gameplay on modern (read reliable) hardware. Listed below are the cabinets we have that offer this game.